April 11, 2010 Adri H.
Lately I've been seeing lots of baby headbands with giant flowers attached to them. So, I thought it would be nice for my friends who craft to have a quick guide to make their own. I made this band for my cousin whose baby has a head circumference of 16.5" but really, it's a flexible enough pattern to adapt to any size (width and length) all you need are the measurements. 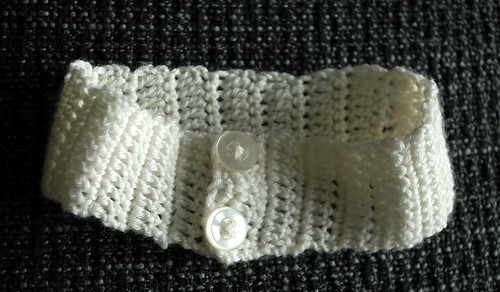 After crocheting the band, a set of buttons is sewn onto the end and the double-crochet stitches allow the band to be buttoned tighter or looser depending on need. I used Regia Silk and a 3.5mm crochet hook. Repeat between *...* until desired length. Continue in this manner, alternating between single and double crochet rows until you have reached your desired length ending with a single crochet row or a picot edge if you desire. Sew your buttons on one end making sure they fit into the gaps between double crochet stitches. Make a crochet flower! I used the "Irish Rose" pattern from Leslie Stanfield's Book 100 Flowers ... It is also called a three-layer Irish Rose, and the exact pattern I used from the book can be found on Lion Brand's site here. P.S. I used the buttons from the headband to secure the flower. It also makes the flower changeable!